Everything's better with bacon, right? So fuel up with it before your next long bike ride or run. You're probably thinking, "Isn't bacon one of the worst foods?" 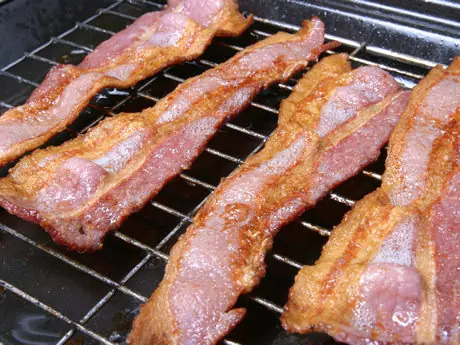 While there are many reasons that you may feel cautious about this high-salt, high-saturated-fat food, bacon can actually help boost your long-distance endurance training. There are chemicals and added ingredients used to cure the meat. These, and specifically nitrates, can be an issue as they have been correlated with increased cancer risk and hardening of the arteries. Fortunately, you can find bacon that has not been cured with nitrates, or with bacon that has nitrates found in vegetables such as celery. Day to day, it's a good idea to keep your sodium intake to a moderately low level. When not accounting for training nutrition, or not prepping for a big workout or race within the next 24 hours, a sodium intake of just 1500 to 2500 milligrams per day is fine for an athlete. Your everyday nutrition should be founded on non-processed foods. On the other hand, there is a time when extra sodium is required and imperative. That's right: immediately before, during and after training. And, bacon can become your tasty "salt pill" of choice. During activity, you sweat. Some athletes sweat more than others, but everyone sweats a significant amount enough to cool down, which affects the fluid and electrolyte balance in your plasma. In spring and summer conditions, many athletes lose an average of 0.5 to 1 liter of sweat per hour. Every liter of sweat contains about 800 to 1300 milligrams of sodium, or for ease in calculating, approximately 1000 milligrams per liter. If you think you lose a full liter per hour, you likely then also lose 1000 milligrams of sodium per hour. Heavy sweaters and salty sweaters lose more (this is generally influenced by weight, heat, activity, genetics and possibly by everyday consumption of sodium). Although you may not be able to replenish all of your sodium losses, and you generally don't need to, you will help your body balance the sodium and fluid in your plasma, improve digestion during training, increase fluid absorption and boost glucose absorption. Athletes do well with replenishing 400 to 700 milligrams of sodium per hour year-round, and 600 to 1000 milligrams of sodium during hot months. If you'd like to fine tune this number on an individual level, you can weigh yourself before and after training, subtract any fluid weight consumed during it, and calculate your fluid loss (all weight changes are likely fluid in this short of time). To replenish sodium, you can use sports drinks, salt, supplements, engineered sports foods and whole foods—including bacon. Simply eat a slice of bacon every one to two hours. Each slice typically contains 170 to 200 milligrams of sodium. Along with fluid, carbohydrates and other sodium sources, bacon can serve as the sodium pill that helps you achieve hourly goal amounts. Try a sourdough, bacon and cheese sandwich on long rides. In addition to consuming 60 to 90 grams of carbohydrates, 4 to 18 ounces of fluids, and 400 to 700 milligrams of sodium per hour, it can really help to add real, solid foods every two to three hours of a five-plus hour workout or adventure. Try a small sandwich (about 1/4 the size of a normal, two-slice bread sandwich) with sourdough, soft cheese like creamed Swiss cheese and bacon. Boil potatoes and add a bit of mustard and bacon for long rides. The potatoes are a delicious and concentrated carbohydrate source. The vinegar in the mustard can keep cramps at bay, and the bacon provides sodium and flavor. More: What Does Your Sweat Taste Like? When it comes to bacon, you usually get what you pay for. To reduce any potentially harmful preservatives, nitrates and junk ingredients, choose organic, local or all-natural varieties. If you can, choose nitrate-free. You've got to replenish your sodium from somewhere, so why not add good-quality bacon to your next long workout? You'll get 170 to 200 milligrams of sodium that will add flavor and crunch. Bacon will have you looking forward to more hours training. Remember, if you're not partaking in long-distance training, keep your bacon intake to low to moderate. Stay healthy with our nutrition guide.